Scheduled to ship in late May 2013. 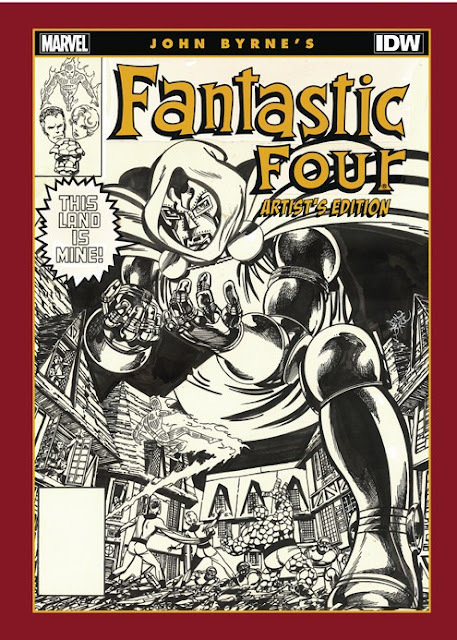 "IDW is pleased to offer more than six issues worth of Fantastic Four stories by John Byrne in the Eisner Award-winning Artist's Edition format. Included in this volume are issue 232 (the first one with Byrne on as writer & artist), issue 238 (the first story), plus issues 241, 243, 247 and 261 as well as the classic What If #36 story,"What if the Fantastic Four had not gained their powers?" There is also an art gallery included that showcases more than a dozen covers. Nearly all of the pages in this book have been scanned from the actual original art that was drawn by John Byrne. This Artist's Edition measures 12 x 17 inches and is 168 pages long. Each book is shipped in a custom cardboard box for maximum protection. While appearing to be in black and white, each page was scanned in color to mimic as closely as possible the experience of viewing the actual original art—for instance, corrections, blue pencils, paste-overs, all the little nuances that make original art unique. Each page is printed the same size as drawn, and the paper selected is as close as possible to the original art board."